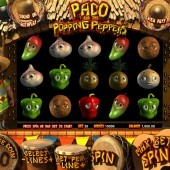 If you’ve played Leander’s slice of Mexicana, Mad Pinatas, or the enthralling Pampa Treasures from the same developer, you’re sure to get a kick out of Betsoft Gaming’s journey to the land of chilli and Speedy Gonzalez, Paco and the Popping Peppers. 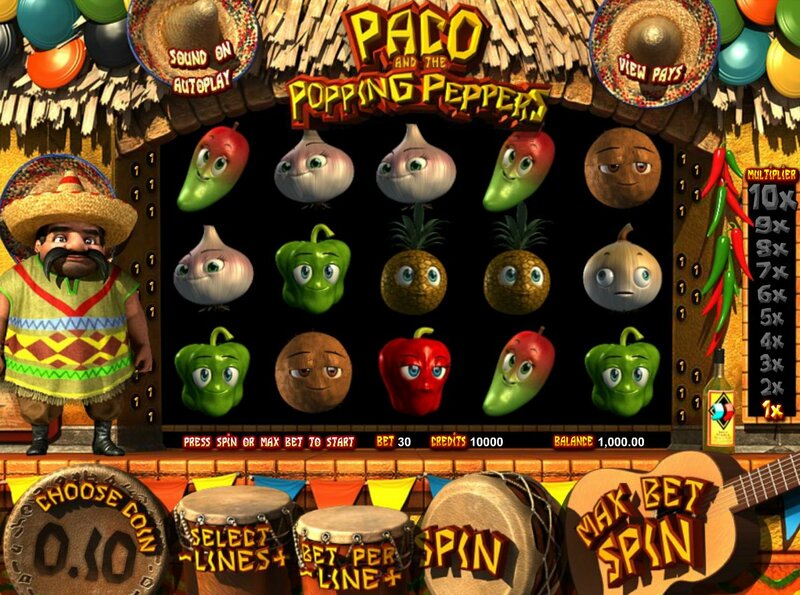 Paco in this case is a stereotype Mexican in a sombrero, handlebar moustache and poncho who stands to the side of the reels egging you on to spin the reels. Slot developer Betsoft Gaming really has ticked all the stereotype boxes here. Putting the stereotype issue to one side, there is actually a fairly enjoyable slot here to play. The reels in this case – five of them across 30 paylines – are filled with some bugged-out looking vegetables: red and green peppers, onions, tomatoes, coconuts, garlic, pineapples, a straw hut and a pinata. Cascading Reels and a Pop Multiplier! There are two base features to look out for here: the Cascading Reels and the Pop Multiplier. Cascading Reels is similar to Tumbling Reels or Avalanche Reels in other developers’ games. Hit a winning combo and the symbols vanish to allow the ones above to fall into their place. This can mean even greater wins in the base game. Look to the side of the reels where you’ll find a scaling multiplier from 1x to 10x. After each winning spin and cascade, the multiplier will increase up the scale. Keep hitting winning combos in a row and the multiplier goes up and up! The Wild in the game is the pinata, a colorful donkey traditionally bashed to smithereens by kids at Mexican birthday parties who’ve been too dosed up on Benzedrine and ice cream. Five of him across the reels pays out a 2,500x line bet jackpot. Three or more hut symbols triggers a Higher or Lower bonus game. Like the straight Gamble feature you’ll find in most slots, you simply have to choose whether the next card dealt will be higher or lower than the last. Get three wrong – or go 10 rounds - and it’s game over. Cascading Reels along make this slot worth playing, but the addition of an increasing multiplier on regular wins makes this game really worth checking out.